The Irish language is the root of Irish Culture. Irish is an Indo-European language and can trace its ancestry back over 4,500 years. It arrived in Ireland about 300 BC when the Gaels invaded the island. It then spread to Scotland and the Isle of Man. Scottish Gaelic and Manx gradually seperated from Irish and from each other and the three languages can be thought of as seperate languages from about the seventeenth century onwards. Today, all three languages are described as “Gaelic”. The other Celtic languages are Welsh, Cornish and Breton. Until the British arrived, Irish was the primary language spoken on the island. Irish was banned by the English invaders in the sixteenth century and it was considered a crime to speak in the Irish tongue. As a result, the English language grew in usage over time and English gradually become the predominate language spreading from the East of Ireland westwards. Western Ireland was considered by the English as less attractive an area and did not get as much attention from the English as the rest of Ireland. As a result the use of Irish as the primary, and in many cases, the sole, language continued in areas of the west. In the latter half of the ninteenth century, the Irish language became one of the pillars of the Gaelic Revival promoted by the Irishmen and Irishwomen who sought independence from England. 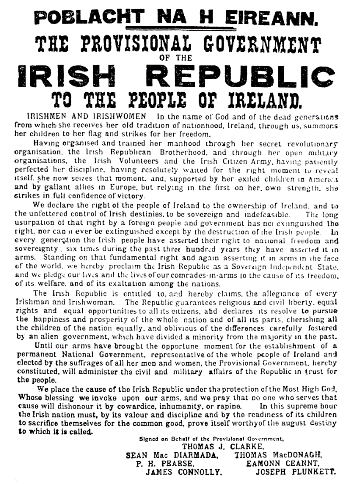 In fact, the first words of the Irish Proclamation are: POBLACHT NA H ÉIREANN (People of Ireland). When an independant Ireland became a reality, Irish was designated as the first official language of the new republic and English as the secondary language. All official documents from the Government of Ireland are in both Irish and in English to this day. Despite the efforts of the Gaelic Revival, the Irish language had a rocky road in the 20th century. As modern technology (radio and TV initially and then the internet) spread throughout Ireland, the number of people who were ‘Native Speakers’ declined. 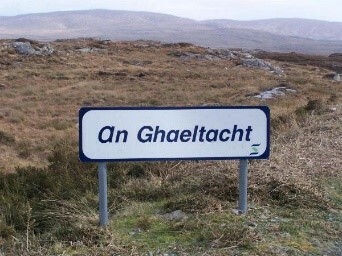 The language was kept alive in various pockets of the west and those areas became know as The Gaeltacht (An Ghaeltacht).The Irish language was a required course for all students in Ireland but many felt it was more of a burden to learn than it was worth. After being given mostly lip service by the Irish Government, the language was finally recognized as something worth perserving and a Department of the Gaeltacht was created (Údarás na Gaeltachta), an Irish language radio station was built (Raidió na Gaeltacht) and finally an Irish language TV station (TG4). The 21st Century has has seen those efforts begin to bear fruit. Combined with a complete change in how the language is taught in school (it is still a required language) and a renewed interest in the language in general there has been a new popularity among not only the old but also Ireland’s young people. Popular songs are being sung in Irish and many would say these covers are as good as or even better than the originals (https://www.youtube.com/channel/UCcfSiyJgWUOxfhlSWry-SmQ). Many young Irish are choosing to use the Irish version of their last name officially rather than the English version. Gaelscoils (schools where all courses are taught only in Irish) have become so popular all over Ireland that there are waiting lists to attend; and its not just Irish speaking parents sending their children to the Gaelscoils (http://www.irishtimes.com/news/education/why-is-it-so-hard-to-get-a-place-in-a-gaelscoil-1.2984851). There are Irish language radio stations in Dublin (Raidió na Life) and in Belfast( Raidió Fáilte). 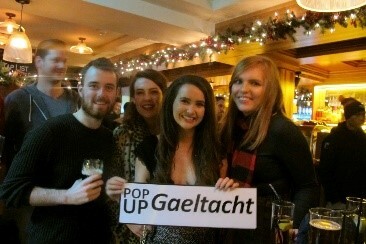 Events such as ‘Pop Up Gaeltachts’ have exploded in popularity, not only in Dublin but all over Ireland and around the world taking over not just a single pub but entire streets. There are dedicated Irish speakers all over the world. The number of Gaeltachts is increasing in Ireland and Northern Ireland and there is even an officially recognized Gaeltacht now in Canada. In short, there is a renewed enthusiasm for the Irish language which bodes well for its future. The Gaelic League (Conradh na Gaeilge) was founded by Douglas Hyde in 1893 as part of the Gaeilic Revival. Many Irish nationalists joined Conradh na Gaeilge and participated in its’ many activities supporting and promoting the Irish Language. Padráig Pearse, the leader of the Easter Uprising in 1916 was the first editor of the organization’s newspaper, An Claidheamh Soluis (The Sword of Light). To commemorate the 125th anniversary of the founding of Conradh na Gaeilge the year 2018 has been designated by the Irish Government as Bliain na Gaeilge (Year of the Irish Language). Events are being organized worldwide to show off the rich culture of Irish in literature, poetry, drama, film, and music. Féile actively promotes the study and use of the Irish Language at the Gaelic American Club. This is done in several ways. Several nights a week, classes are held for people at all levels to learn and improve their knowledge and use of Irish. The classes are open to all (GAC members and non-members). In addition, there is a conversation group which meets in the pub where Irish speakers at all levels sit around and speak about whatever is on their mind using as much Irish as they have. Every year, Féile sponsors at least one Lá Gaeilge at the GAC. A Lá Gaeilge is a fun filled day of Irish language and culture where language students at all levels meet to improve their skills. Participants have a wide range of language proficiency and include people who have never heard or spoken Irish before up to people who learned Irish growing up as a child as their first language (Native Speakers). The common thread among everyone is an interest in the language and a desire to help each other. People come from all over New England and the Middle Atlantic States to the GAC to participate.